A team of researchers have managed to unblock forgotten memories in lab mice using light pulses, a report published in the journal, Science, says. Using a group of lab mice, chemicals, electric shocks and light, scientists have managed to recover previously lost memories. The process of memory consolidation, when a short-term, unstable memory turns into a long-term one, takes place in so-called memory engram cells - a collection of specific neurons. In the experiment detailed in Friday's report, a group of lab mice were injected with a virus which made these neurons produce a light-sensitive protein, thus activating in response to light. The mice were put in a chamber where they received an electric shock. The rodents remembered the exerience and came to associate it with the chamber. When they later were taken into the chamber, they froze in place. 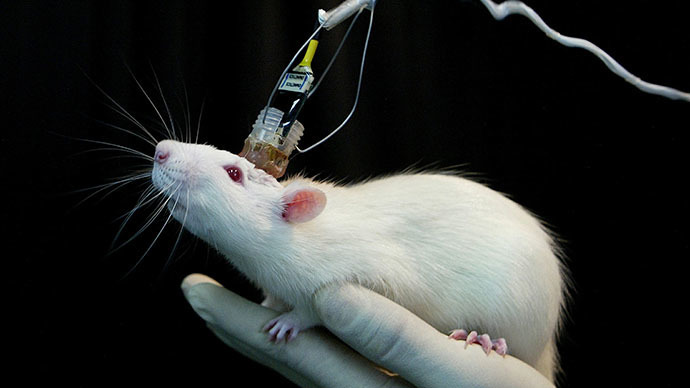 The mice were then injected with a chemical called anisomycin, which prevents memory consolidation. After that, the animals no longer showed signs of recognizing the chamber where they had been electrocuted before. Then, the scientists used pulses of light to activate their engram cells. After that, the animals again started freezing in fear when brought to the electric shock chamber. "These findings are probably applicable to certain conditions of human amnesia, such as an early stage of some Alzheimer's patients," Susumu Tonegawa, director of the Japanese RIKEN Brain Science Institute, and one of the authors of the reports, said. What this means, researchers say, is that memories that appear to be lost due to illness and trauma, could actually just be just blocked, while remaining recoverable. The exact mechanism of amnesia has not been completely discovered. While some scientists believe it is caused by permanent damage to memory-storing neurons, others, like Susumu Tonegawa, believe it is the blockage of access to those neurons that is the problem. In the latter case, not all is lost for human amnesiacs.